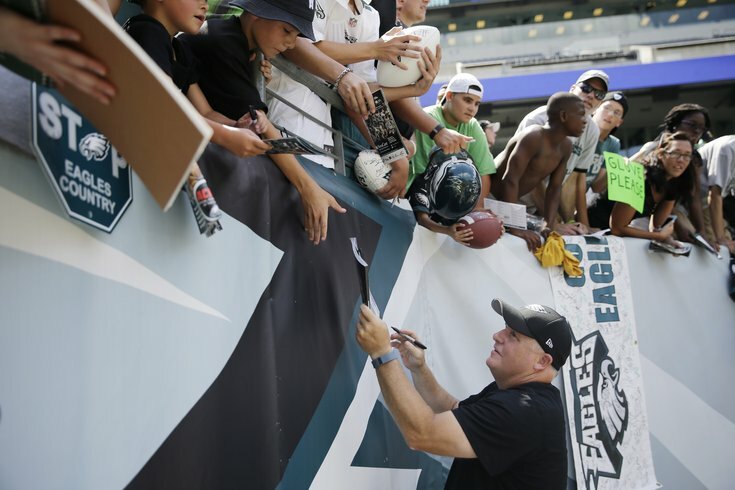 Former Philadelphia Eagles head coach Chip Kelly signs autographs during training camp. Former Philadelphia Eagles head coach Chip Kelly released a statement on Wednesday evening, his first public comments since he was relieved of his duties following a 6-9 record in his third season as head coach. What is Lurie looking for in next coach? "I'm grateful to Jeffrey Lurie for allowing me to coach his Philadelphia Eagles for the past three seasons," the statement read, per @MikeGarafolo. "I deeply regret that we did not bring this great city and its fans the championship they deserve. I was blessed to work with a gifted and hard-working coaching staff every day, and they will succeed wherever they go. "Finally, my players mean the world to me. I will miss them very much and I will be rooting for them to achieve their dreams. Life is all about responding to challenges and seizing opportunities." Earlier in the day, several players spoke about the lasting impression Kelly left on them during their time together. Others, however, were less positive in their assessment of his time with the Eagles. During his press conference on Wednesday afternoon, owner Jeffrey Lurie went out of his way to thank his former coach, despite the fact that he decided to part ways with Kelly..
"I really just want to publically thank Chip," Lurie said. "Nobody worked harder the last three years, and [he’s a] smart guy. It was a bold decision to hire him and [we] had certainly some success. I wish him the very best, as I did yesterday."